About When the first baby laughed for the first time, the laugh broke into a thousand pieces and they all went skipping about, and that was the beginning of fairies. Well I'll be... thanks for letting me know. I never looked at the definition, just assumed it was based on the techniques I employed. Which category? According to who? All my images are digital, regardless of category. hmm I thought this category was NON digital..
fairy image. I like it a lot. Lovely image with reflections of the tree on water...very well composed, I'm impressed! Ilove the mood of this, nice tones and light also... your art and shirleys fuells my inspiration to create my twin girls into the faeries they love..wish they had workshops on this! lol :) Congrats! M A R V E L O U S .i LOVE PORTRAIT PHOTOGRAPHY. tHIS ONE IS OUTSTANDING. Antonia, this is fantastic artistic work. Excellent! fantastic as always. I just love this series. Amazing amount of detail to please and tease the eye in this shot Antonia . . . Beautiful work! i'm happy alll is well, see you later..
hehheeh no problem at all! and thanks a lot for your kind comments on my own pictures! have a nice day! Ricardo, so sorry I missed your wonderful comment until now -- thank you for your kind praise. hope all is well my dear antonia..
How wonderful to see your work on the Home Page again. I love your About. Now that I am a grandmother, it strikes close to my heart. The toning of your picture is grand. It's lovely how she blends in to become part of the forest. Congratulations on EC. I hope all is well with you. wow! great, splendid composition! it's truly a masterpiece! impressive detailing and awesome processing! wonderful in every way! favorite! I had a feeling of that - I think it's mentioned in location, but the giveaway of the editing was the wing... :) Did you draw that yourself or find one to enhance? This is a favorite! I love the tones and the pose of the girl is priceless. She's beautiful and the details are well seen here Antonia. Fabulous shot. I love the comment about the beginning of fairies. Beautiful picture. Toni - I have been an admirer of your work for so long, but didn't feel like I had anything worth adding. Your work amazes me. You seem to get that compliment a lot, and you deserve it. The skill and artful, masterful hand you have create images that one carries with them in their mind and soul for years. And in all seriousness, do you ever teach seminars/classes on your work/style? Sian, thank you. The vertical line on the right is part of the vegetation, rather than a rope. It's interesting you should mention that, as I don't know whether I've focused on it before. I just adore this, and J.M. Barrie's Peter Pan of course. Wow! What is the vertical line on the right hand side? I keep thinking it's a bit of a rope ladder. I don't know why it is distracting me. The sentiment is mutual then! Hugs and kisses to you...sweet Biliana. wonderful! I love your style dear Antonia! Another amazing photo, Antonia! I'm surprised you would ask me about PS - you've obviously mastered it quite well! :) Only the very edge of her dress (wing? :) looks a bit as if it were drawn in, but honestly, if I didn't know that you had added her in, I don't know if I would have picked up on it! You have some really strong and wonderful work in your portfolio - I'm glad to have made your acquaintence! Another favorite. This is a real work of art. The tones, the background, the subject...everything is just perfect. So glad you enjoy them, Nicole. :) Thanks. T.
excellent, I just love your fairy series. Thank you, Carsten. I'm pleased you are enjoying some of my work. Antonia. Magic shot, enchanted. Artistic toning. Great result, congrats. Toni, this is very magical. it must be nice to be able to have a fairy to put in a shot like this. after all, without the fairy, it would be just a pretty shot. 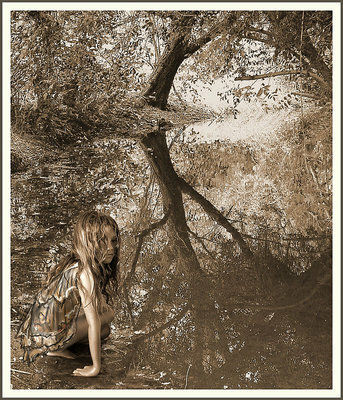 I also like the sepia effect and the slight aberrations created by the water reflection. Nice that you noticed and commented on the subject's awareness...you are the first, and it is something that I enjoy about this. Thank you Ian. You look beyond the borders a lot, don't you. T.
Well placed in the frame here. More aware thasn the cameras eye looking beyond the borders.. Thanks very much, Pat. This is one of my personal favorites, and I really appreciate knowing you like it. T.
So sweet Carla...:) garsh..thanks. nite-nite. me too..I'm outa here and to bed. This is wonderful...can I come take Toni BauerleinSehnert 101? Excellent work. BTW - last post, good night. Unbelievably beautiful Toni, very strong! and cleverly done. Toni, I really do not know what to say, this is stunning! I like how you included most of the tree in the reflection only. Ilike this one too ...evry thing is great .. There should be a sound like Tinkerbell, every time someone puts this image in favorites...at least one sounds in my heart. Thank you. :) T.
Stunning and magical - a fav! ..almost surrealistic ; excellent work !!! That's fantastic Judi! I am really looking forward to seeing your new series. It is fun to share with you. Thanks. :) T.
Fairies do exist...you need to belive in life to know they are there. Thankyou so much for your wonderful comment on my image. I love this new series of yours...it is actually quite similiar to my new series which I will be putting together (finally) in about a weeks time. I have been busy for the last few weeks taking photos for it all. I'm very happy you like it so much, Rebecca. T.
Thank you for your thoughtful comments and kind remarks, Andre. As for the shadow, while I had no objection to the remark that was made by Fabrice (his observation was astute), the excuse you invented for me is charming...I'll have to remember it for the future. T.
I'm very flattered David. Thank you dearly. :) T.
Fabrice, please never feel the need to apologize for pointing this out. It is so important to me to really know what others notice. Often I think we (myself included) hesitate to point out these nuances and go on merrily believing no one notices. While I don't believe in picking on things at every turn (it would be exhausting..lol), I invite my friends to do so whenever the spirit moves them. This is how we get better. My motto for 2005 is going to be.."please pick my photos apart, I think I'm ready now." You always have my best interests at heart and that's what counts. Thanks for that. T.
Sorry Toni to have pointed out this very small imperfection.. Anyway, it is very very small.. and the whole composition is so beautifull that it is not visible as we are attracted by the magic atmosphere that you perfectly succeeded to create. Fabrice, thanks. I trust you to tell it like it is. I was hoping no one would point that out and I could sneak by with that small imperfection. Actually, there is a shadow beneath her that extends outward over the dirt (perhaps it is too subtle). But as I analyzed this completely, I thought there might be a touch more of her cast outward, but that was more than my little brain could conjure, and I was loath to upset the beautiful reflections of the trees. Perhaps I will work it in later so there is even more reality. T.
I think this is one of my favorites at all here! excelent work, very beautiful, almost like in a dream. This is a wonderful photo. I love this type of sepia. It fits the mood beautifully. It reminds me of the type of illustrated pages of books from another time. I saw your earlier post (without the fairy) That was good too, but the addition of the little girl improves it 100%. Someone mentioned that there was no shadow included. Well, Peter Pan had no shadow either, did he. Toni, love the fairies and the imagination. This is wonderful. Can't wait to see more. The hand is a bit distracting but it is a great photo. love the mood, and the composition is superb! beautiful work, this is Art! I would not be suprised to see this on the front page later.. Very nicely put together Toni and think this works really well :) I like it. Absolutely awesome. To my favorites! Heheh.. magic shot Toni.. The composition is very nice, with a real magic atmosphere.. Well done!! just a small remark.. the shadow of the child is missing even if you put her in the left foreground.. but very difficult to create it..this is MHO :).. Anyway congrats for this beautiful dreaming shot. It means a lot to hear you say that, Steve. Thank you. T.
That is most flattering, Roberto. Thank you dearly. T.
Thank you! I'm so flattered Amna that you would place it in your favorites. It doesn't look like it registered, so you may want to check it. T.
Thank you Kelly :). This one is just for me...no money involved, just did it for the fun of it. It's going on 2:30 a.m. and this one kept my fires burning long past my bedtime. I'm so happy you like it. T.
Fabulous work Toni, it could be the first page in a fairytale book - so well imagined but superbly done. How do you get them into the picture SO perfectly?????? This is totally amazing...... i love it....... well done..... i hope your charging money for these pictures.....lol...... they are well worth every cent. yes! this is really much more beautiful! congrats, the add of that girl absolutely make this photo now. Another masterpiece!!! !Really a great picture,the child is perfectly placed and the tones are superb like in an old tale,congrats Toni,into my favs.